Oh! We love Grandparent’s Day! It is such a special reminder of who we are, where we come from and learn from an older generation. Grandparents are such an amazing gift to our lives because they have a special way of loving on kids and finding ways to have fun with them. 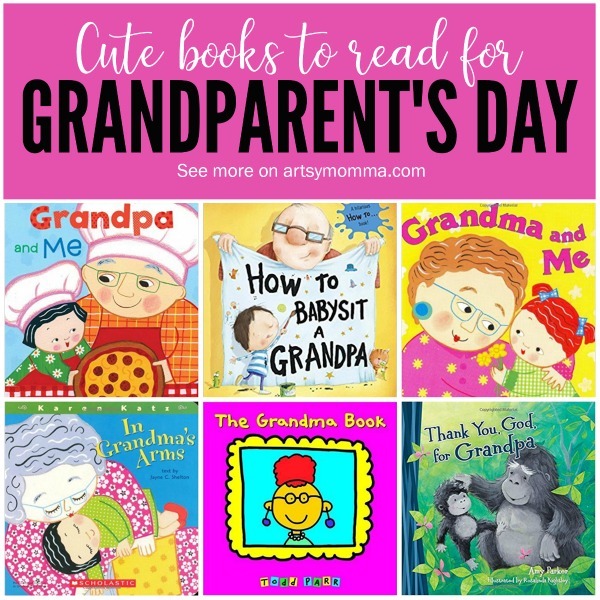 In this post, we will share two fantastic books about Grandparents that we received for us to review, as well as a list of cute books for Grandparent’s Day. We hope you enjoy them and that you get some to read with the Grandparents in your life. *This post contains affiliate links. Please read our full disclosure policy here for more info. Books can take you anywhere and everywhere, and this imaginative book it takes you on an adventure in the city. Grandpa is not used to living in the city and nothing he tries compares to fishing. Eventually, Grandpa and the granddaughter have a blast fishing together in their make-believe ocean right outside their window. 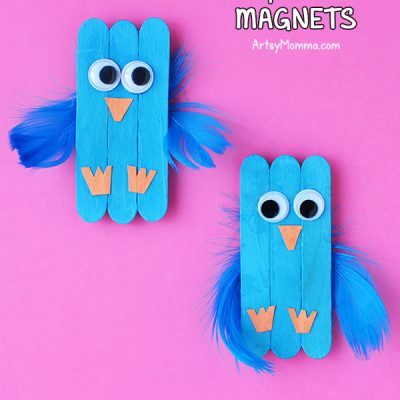 The pretend fish all get funny-sounding names that are sure to have your little one giggling. I like how it showcases how Grandpa adjusted to his new life in a place unfamiliar to him. When Grandpa—a fishing connoisseur—moves to the city to live with his family, it doesn’t take him long to notice that there is nowhere to fish. Unfazed, his granddaughter proposes they pretend to fish out a window . . . until they actually catch something: a Flying Litterfish! Soon the two are catching all kinds of fish: Laundry Eels and Signfish, a Constructionfish and a Waste-muncher. It’s all in good fun, until the skyfishing attracts the attention of the Troublefish (read: police car). This might be the end of their skyfishing, but it’s just the beginning of their new friendship. 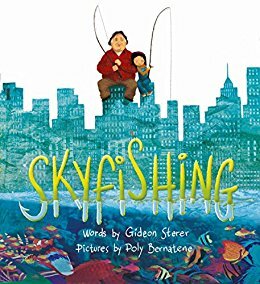 Skyfishing is an imaginative debut picture book that celebrates the magic of companionship. We love the Ladybug Girl series and own a handful of the books (see our review of Ladybug Girl and The Best Ever Playdate here). The illustrations are always fun and the quality is thick/sturdy. 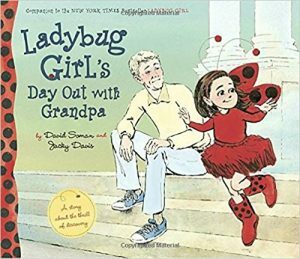 Ladybug Girl’s Day Out with Grandpa is another cute book that we are happy to have in our collection. This story includes little life lessons while visiting a museum together. Perfect for toddlers, preschoolers and even 6 year olds to read to you since the text isn’t overwhelming for their age. When Lulu and Grandpa visit the museum, Lulu wants to see it all! Grandpa suggests exploring bit by bit, but Lulu can do it all—she’s Ladybug Girl! But there is so much to see. Even Ladybug Girl may never see it all. Then Grandpa shows her something extra special: the butterfly room! Inside, Lulu slows down. She looks and listens. And she realizes that Ladybug Girl can be like a flower if she holds very still and thinks flower thoughts. When a shining blue butterfly lands on her finger, she understands that even if she can’t learn everything in one day, she can learn so much from each moment, if she only takes the time to look around. Aren’t these books wonderful?! The fishing one reminds me of my grandpa, who also was the ‘father figure’ in my life. He used to take my brother and I fishing all the time, taught us how to clean them, and we had a fish fry every Friday. Take a look at some wonderful suggestions below! Click the titles to read more about each. 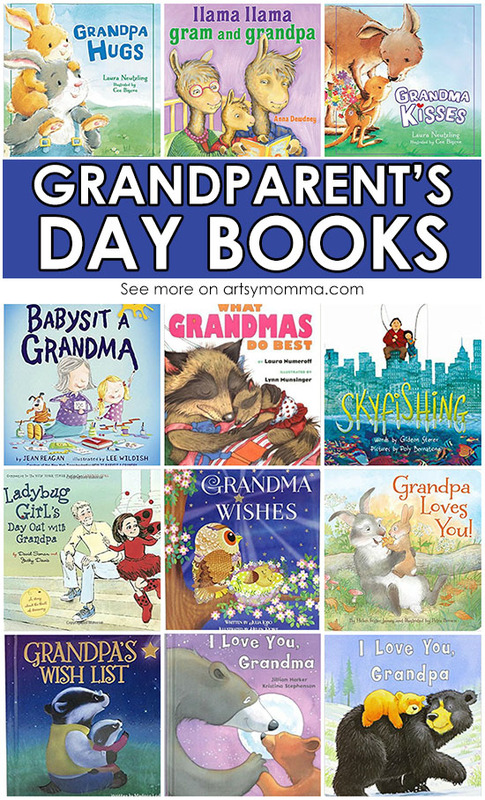 I Love you Grandpa (Board Book), I Love You, Grandpa (Hardcover) We love this entire series and even have a jumbo-sized version of the Grandma one! Besides reading these books for Grandparent’s day, I will also have a few more ready for our next visit to Grandma’s house. Which titles do you think you’ll look into reading? 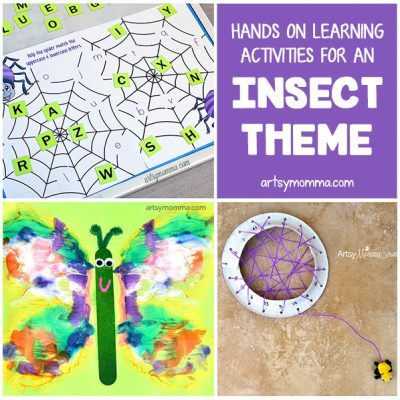 You may also enjoy our awesome list of Grandparent’s Day handprint crafts.